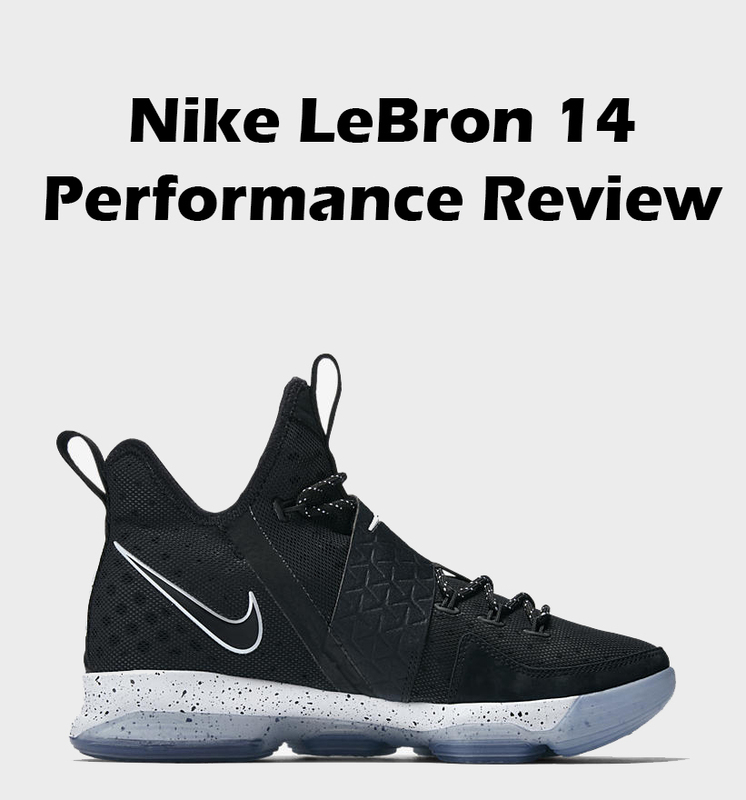 Nike LeBron 14 PERFORMANCE REVIEW – Is It Worth Buying? Hey guys! Today we have something special for King James fans – The Nike LeBron 14. Now, LBJ is one of the most popular NBA players, so it’s no surprise that each and every year LeBron’s signature shoe line gets huge amount of attention. Of course, the biggest question is how they performed on court. So don’t waste any time and see what can offer to us the brand new Nike LeBron 14. Welcome to my Nike LeBron 14 PERFORMANCE REVIEW! The upper is covered with foam & mesh combo with fuse overlays in high pressure areas for better lateral stability. I mean nothing special or premium about this but it gets the job done nicely. Materials offer great flexibility, lovely comfort feel and on top of that solid durability. It’s a nice addition to this model because the past models of The LeBron’s signature line had hard and restricted uppers. The new upper doesn’t restrict your natural feet movements, you are getting better transition and more enjoyable feel while playing. In result, the upper performed really great, no complains. Hex Zoom Air units are back again but this time the units are even larger and thicker. The past LBJ models had very solid cushion systems but the main problem was that the Zoom Air units were encased in hard rubber. In result, the Zoom Air units were not capable to perform as they should, despite hard, restricted rubber. In this case, the LeBron 14 Air units are encased too, but now the rubber is much softer. So you are getting more powerful impact protection and big bounce, especially in the heel area. However, I think that the rubber compound is still to firm. They need to make it even softer in order to release that full Zoom Air power. At the end of the day, the cushion tooling in LeBron 14 performed better than the past LeBron 13 model. Big guys will love it. We have the translucent rubber with digi-camo pattern on it. As we all know, the Nike translucent rubber is not as great as the simple rubber. Surprisingly, this translucent rubber performed not that bad as I expected to perform. On clean court I had no huge problems with them, maybe just a few minor slips here or there but nothing to crazy. The LeBron 14 gripped the floor nicely, solid move coverage and nice stopping power. Not the best traction in the market but also not that bad by any means. The main problem with this traction was playing on dirty courts. As you can see, the digi-camo pattern has a lot of small holes in it, so it’s a perfect place for dust to stick in it. For this reason, you need to wipe them as often as possible to prevent yourself from sipping all over the place. I have some bad news for outdoor players… The rubber compound on these is too soft and not so durable, especially for outdoor usage. I recommend going true to size for that nice one-to-one fit. Now I’m more likely wide footer so true to size pair fit me perfectly. Although, if you want very and I mean VERY snug fit with zero dead space, then going half a size down would be great for you. As I said before, we have the soft and flexible upper so it provides with comfortable fit. Heavy padding inside the shoe adds even more comfort to its total. The strap is what I liked the most. 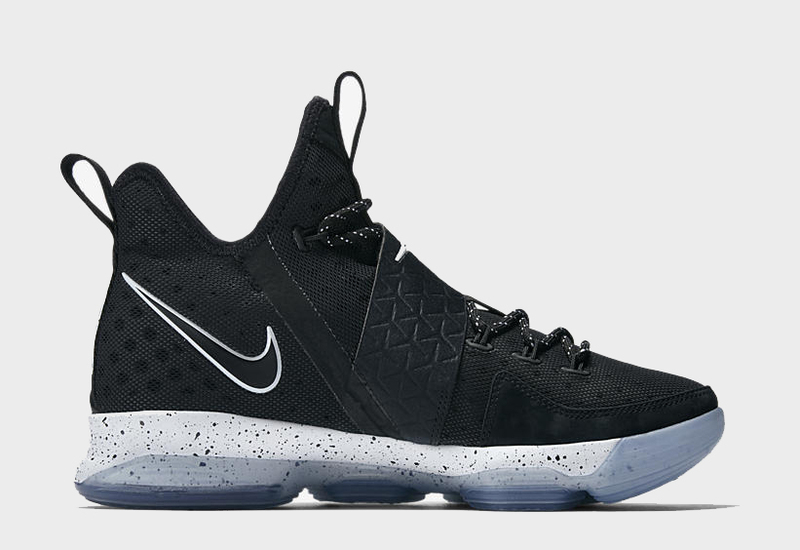 I’m very happy that they decided to add a strap to LeBron’s main model because on the Nike Soldier models it works perfectly. How it performed on the LBJ 14? PERFECTLY, as I expected. The strap just locks you forefoot and keeps it tight and secure throughout the game. The internal and external heel counters are the main support features. It simply works quite well. BUT… The forefoot area doesn’t have much to offer talking about support. The fuse backing is too soft to keep your forefoot in place while doing quick stops or moves. In addition, the midsole and outrigger lack of stability since the outrigger is rounded and not very aggressive. The last models had solid stability and aggressive outrigger to keep your feet in place, so I don’t know why they changed it. To sum up, the back area of the shoe has great support but the forefoot area could be much better. The best aspects of the shoe are cushion setup with great impact protection and the upper with flexible materials. Traction is quite solid too as long as you keep it clean. The LeBron 14 is versatile shoe. It doesn’t matter if you are a big or small guy, they will definitely fit your requirements. In my opinion, the LBJ 14 performed solid, but I don’t think that they are worth $175. If you look at today’s basketball shoe market, you can clearly see that there are sneakers with better performance and smaller price tag to choose from, like adidas Crazy Explosive. But don’t get me wrong! If you feel like the LeBron 14 is perfect fit for you then go and grab it. You won’t regret it. What do you guys think about The new Nike LeBron 14? Did you cop it? Comment below! 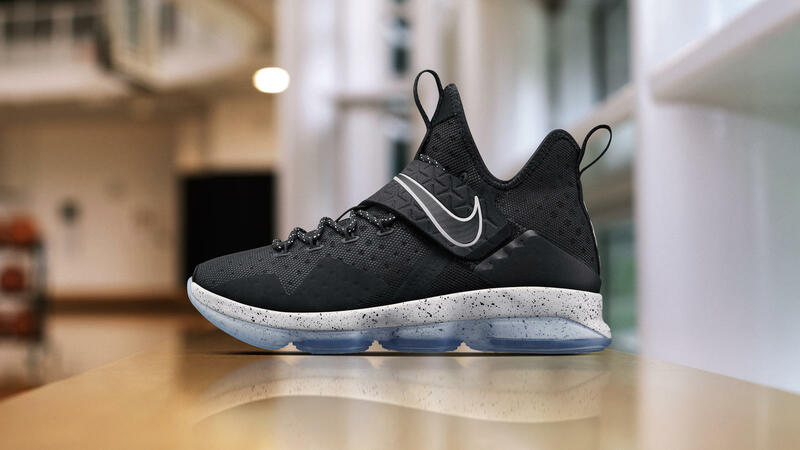 Nike Lebron 14 “BLACK ICE” – New Style for Lebron? My brother is in a basketball team but he has been losing his matches forever. After Deron Williams trade he will start watching Cleveland games. I wll ask him about a new shoe during the game. His feet are really big and I think he will love these shoes. It’s all about practice – Allen Iverson. LOL 😀 I think D.Williams will be a nice addition to Cleveland (A big fan of this team). The LeBron 14 should be a perfect fit for him since the upper is very stretchy and has plenty of room for big feet. Yeah, I agree with you. Lebron now is 32 years old, so the main priority for him is great performance, not aesthetics. It would be very crucial for him to get injured, especially for CAVS. If you have the past models, I highly recommend you to pick the LBJ 14. You won’t regret it! Really great review article. I know Nike LeBron 14 is mainly for basketball. But I really like the cushion and support features. Will this shoe work well as a jogging shoe? Big thanks for the support! Everybody has different taste. Personally, I think the LBJ 14 is one of the best looking model in Lebron’s signature line. Yeah, traction is probably the worst aspect in this shoe. For outdoor bball players I recomment The Nike Zoom Live 2017, perfect budget model. I play basketball a lot and as far as I can see this shoe has all it needs in order to deliver a great grip and comfortability. You are right that the price is a bit high but overall I think that it is a good investment for serious players. You’re damn right. Maybe the traction tooling is not the best one, but still solid nonetheless. Of course, now we have a huge variety of cheaper models to choose from. But if the LBJ 14 fits your requirements then the $175 price tag is not an issue. A very detailed overview of the sneaker. I was curious, where would i be able to buy a pair for myself. I appreciate it. You can easily grab them in Nike or Finish Line. I really liked how thorough you were in this review. I’m not much of a basketball person, but I do know that shoes make a huge difference in everyday life, as well as in sports. So if this one was one you didn’t recommend overall, what pair is your favorite so far? Thanks! I always traying to make my reviews as informative as possible. The adidas Crazy Explosive is my go to model for now – fantastic all around shoe with the best cushion setup in the market. Awesome! Nice pick up tho. Where did you get them? The cushion isn’t for everyone, so I guess you’re a bit heaver player. Looking forward for the next update. And huge thanks for sharing your experience with me! I got you. As long as it works for you.